A busy working mother, Allison Drake enjoys cooking healthy meals for her family. Allison, who is a certified diabetes educator at the Diabetes and Nutrition Center at East Alabama Medical Center, is providing her favorite recipes and tips for healthy eating. Allison plans menus ahead for her husband, Joseph, and their two children, Wynton, 4, and Emmy. 3. On her days off from work, she will cook ahead or at least prep some of the dishes ahead. Born in Dallas, Texas, Allison and her family moved to Dothan when she was 5 years old. After high school, she attended Auburn University and graduated in nutrition and food. She then attended the University of Alabama at Birmingham where she completed a dietician internship and received a master’s degree. 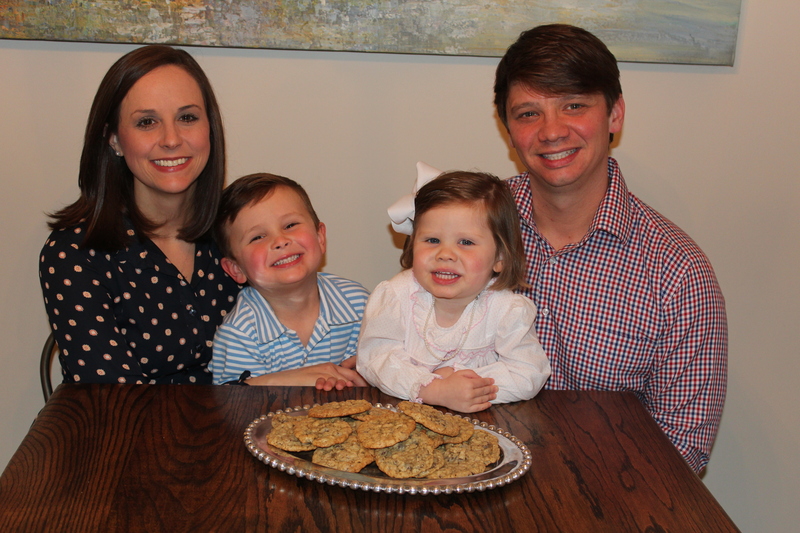 Allison started her career at the Lanier Hospital in the Valley as a clinical dietician. Four years ago she began working part-time at the Diabetes and Nutrition Center at EAMC. Allison enhances the flavor of roasted chicken and vegetables with herbs de Provence. If you don’t have that in your spice cabinet, she suggests substituting rosemary and thyme. Generally, she tries to adapt or develop a recipe using ingredients that are readily on hand. She suggests cooking what is season, which will save on the grocery budget. On her off days, she will cook ahead or at least prep for meals. Just having some things chopped ahead make creating dinner easier when she come home from work. She suggests seasoning vegetables well and adding a little oil or butter to enhance the flavor. Instead of boiling broccoli, she prefers to oven roast the vegetable. “Some people think healthy means eating bland foods, but that is not true,” she says. For snacks, she recommends oranges, grapes and bananas for children. “If they want a granola bar or goldfish snacks, that is alright sometimes,” she adds, “but I always try to offer things like fruit, cheese or rolled up luncheon meat that is not just junk food. Goldfish and graham crackers aren’t that bad, but they are not full of nutrition. They are empty calories. Children will learn to eat those things if that is their option. When asked about their favorite food, Wynton says he likes green beans, while Emmy says her favorite is broccoli. Allison feels people often confuse eating healthy as being more expensive. She tells class members if they find items on sale, it is not more expensive. While it takes more time to prepare and cook, the bottom line is it is less expensive than picking up junk food at a grocery store or drive through. During the winter months, Allison makes soups and puts the leftovers in the crock-pot on low or warm to have it ready to serve when she comes home from work. Joseph, who is a pharmacist at Main Drug Store in Union Springs, also cooks. He grew in Dothan a couple of blocks from Allison, but they did not meet until they were students at Auburn. His mother was also a dietician and enjoyed cooking for her eight children. If Allison is working on Joseph’s day off, he will cook dinner. One of his favorite recipes to prepare is Goat Cheese Stuffed Chicken. He will brown the chicken in a skillet and finish in the oven or cook it on a Green Egg. Both Joseph and Allison enjoy growing vegetables and herbs. Allison is close to her grandparents in Texas, “ReRe and Baboo,” who always have a garden, and she relies on their suggestions on gardening. “It is important to me to cook for my family,” says Allison. “It is a way I care for them and love them by cooking a balanced meal. I also think it is more than just for health. God gave us food not just to eat for our health but for enjoyment; I think you can have both. “When we eat at the table,” she adds, “we find we are able to talk to each other. The kids will say things without asking. We can talk about the good and bad parts of our day. It is something really special. Plan ahead and make a menu for the week, making a shopping list for items you will need. Include on your list items for a healthy breakfast and healthy snacks. Ideas are eggs, oatmeal, toast, peanut butter, yogurt and fresh fruit. When you go to the grocery store, never go on an empty stomach, and try to stick with the items on your list. A budget saving tip is to make your menu with the grocery store’s weekly ad, so you can know what produce and meats are on sale. Take a couple of hours and prep your meals (wash veggies, chop, assemble dishes) on a day off so that when you are busy you will have things semi-prepared. Stick to your meal plan. Resist the urge to grab a bite to eat at a drive through. Instead, eat what is at your house, even if it may take a few extra minutes to prepare. Involve the entire family, if possible, in making the menu and preparing the meals. This will allow your children to learn how to cook. They may be more inclined to try something new if they helped prepare it. Sit at the dinner table together, with phones put away and turn the television off for at least two week day meals (or more if possible!). If time allows, go for a 10-15 minute walk after meals to help digestion and blood glucose regulation. Brown meat and drain excess fat. Add in onions and peppers until tender. Add flour and stir; allow to cook for 1-2 minutes. Slowly add broth and continue to stir. Add in the remaining ingredients and simmer on low for 45 minutes to 1 hour. Remove bay leaf before serving. Enjoy with homemade cornbread or grilled cheese! Heat oil over medium heat and add in shallots (or onions) and cook until tender. Add in garlic. Add the tomatoes and broth and simmer for 15-20 minutes. Using an immersion blender, puree the soup. Before serving add in the half and half and basil. Over medium heat, pour in oil and sauté onion, celery and carrots until soft. Add garlic. Add broth and rice and allow rice to cook most of the way though. Five minutes before rice is cooked through, add chicken and lemon juice and dill. Add salt and pepper to taste. Over medium heat, pour in oil and sauté onion until soft. Add in flour and allow to cook for 1-2 minutes. Add in, slowly, broth and broccoli. Allow broccoli to cook for about 10 minutes and then add in the remaining ingredients except rice and cheese. Simmer for 15-20 minutes. Serve over cooked rice and sprinkle with shredded sharp cheddar cheese. Note: The soup is also good served without the rice and cheese. Pound out chicken breasts to make them about ¾ to 1 inch thick. In a small bowl, mix together ricotta cheese, egg and oregano. Salt and pepper chicken breast on both sides. Add oregano to chicken. Place chicken on 9 x 13 baking dish and place half the ricotta mixture on each chicken breast and fold it over. Pour the jar of marinara sauce over chicken and around the sides. Cover in foil and bake at 350 degrees for 20-25 minutes. Take foil off and sprinkle with Parmesan cheese and mozzarella cheese. Allow cheese to melt and/or until chicken is thoroughly cooked through (165 degrees internal temperature). Serve alone with a side salad or add spaghetti squash for an extra special taste! Brown meat and drain excess fat. Add in onions and peppers and cook until soft. Add in diced chili peppers. In a 9 x 13 baking dish pour about half of enchilada sauce into pan and assemble each enchilada by scooping 1/3 cup of meat mixture and cheese into each tortilla. Place in pan seam-side down. Continue to do this until all of the tortillas are full. Pour the remaining sauce on top and sprinkle cheese on top. Bake at 350 degrees for 25-30 minutes or until bubbly hot. Good served with cilantro and sour cream and side of black beans. Preheat oven to 400 degrees. Line sheet pan with parchment paper or foil. Season chicken on both sides with salt, pepper and herbs de Provence. Place chicken on pan and then add all the vegetables around the chicken. Drizzle everything well with olive oil. Cook for 40-50 minutes until chicken is done and vegetables are tender. Super quick and easy meal that is sure to please the entire family! Mix carrots with all the ingredients and place of sheet pan. Roast in oven at 400 degrees for 30-40 minutes or until carrots are tender. A kid favorite! Salt and pepper both sides of chicken. Mix all ingredients for cheese stuffing together in a small bowl. Add about 1/2 of the mixture to one side of each chicken breast. Fold over the chicken breast and secure with a few toothpicks, if needed. In a cast iron skillet drizzle about 1-2 teaspoons of canola oil. Pan sear both sides of chicken for about 3-4 minutes each side. Place chicken in 375 degree oven for about 20-25 minutes or until center reaches 165 degrees. Cream butter and sugar together with mixer; incorporate eggs and vanilla. Add flour, salt and soda and mix well. Lastly, add in oats and chocolate. Using a scoop, line baking sheet with cookies. Bake at 350 for 8-10 minutes. For sure to be a crowd pleaser! Thinly slice eggplant and place on a sheet pan and drizzle with olive oil. Add salt and pepper. Roast in oven (400 degrees) for 15-20 minutes. Using a vegetable peeler, cut zucchini long-wise and place on sheet pan and drizzle with olive oil. Add salt and pepper. Roast in oven (400 degrees) for 5-10 minutes. Over medium heat, brown meat and drain excess fat. Add in onions and mushrooms and allow to cook for 15 minutes. Add jar of marinara sauce. Allow to simmer. In a small bowl, mix together ricotta cheese, egg, Italian seasoning blend and ¼ cup Parmesan cheese. In 9 x 13 dish, line the bottom with the eggplant, then some of the meat/sauce mixture, then some of the ricotta cheese mixture. On the next layer, place strips of zucchini and repeat the process until all ingredients are used. Top with Parmesan cheese and mozzarella. Bake at 350 degrees for 30-40 minutes or until bubbly. It is a little time consuming but is really delicious and low in carbs. Slice spaghetti squash in half (using a steak or serrated knife works best) and scoop out seeds. Drizzle a little bit of canola oil and add salt and pepper to inside of squash. With insides face down, bake spaghetti squash for 25-30 minutes or until fork tender. Allow to cool. Meanwhile, brown beef and drain fat. Add marinara sauce and simmer. In a medium size bowl, mix together ricotta, egg, spices and Parmesan cheese. Take a fork and fork out spaghetti squash and place into 9×13 baking dish (spray non-stick cooking spray first). Add ricotta mixture on top of squash. Pour meat mixture over top and add mozzarella cheese. Bake in oven 20-30 minutes or until bubbly and heated through.